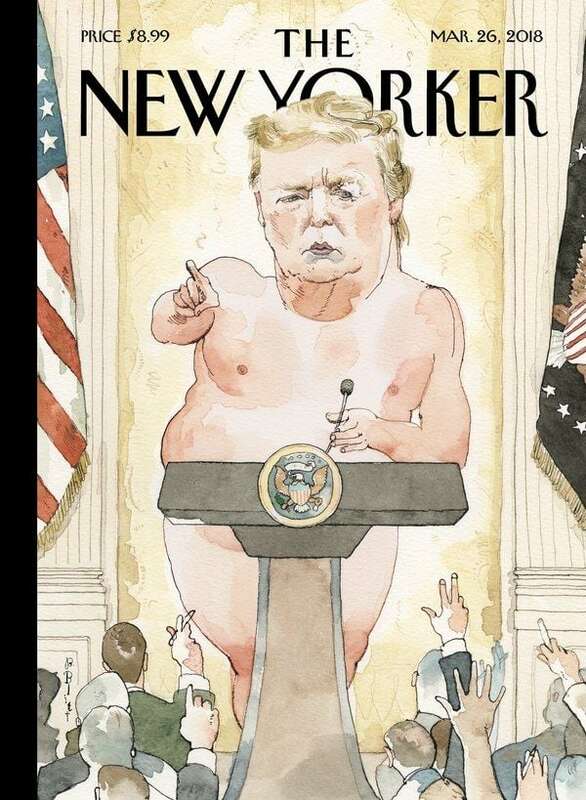 If we ever get through this presidency in one piece, we will look back on the cover art of The New Yorker as representative of the way that thinking, feeling people reacted to our 45th President. (As to how his supporters feel, I could care less.) I have been reading the magazine on and off for over half a century. In the end, what I remember most are the covers. There are a few stories that I will always remember, such as the issue that contained the whole of Truman Capote’s In Cold Blood. I will always remember Election Night 2016 as the worst night of my life. I was in Quito, Ecuador, watching the results coming in on CNN. As the night went on, I was feeling sicker and sicker. The next day, I was to fly back to the U.S., which I suspected was about to be changed forever—for the worse! 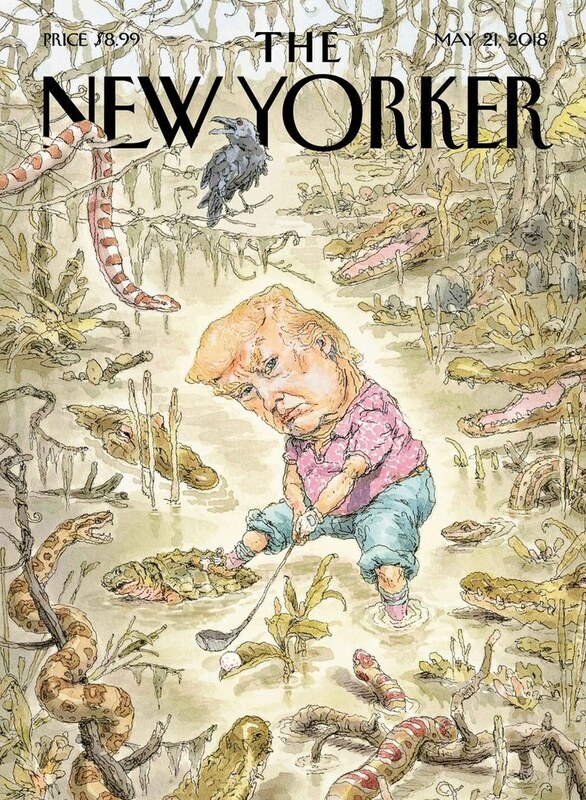 He Never Did Clear the Swamp, Did He? 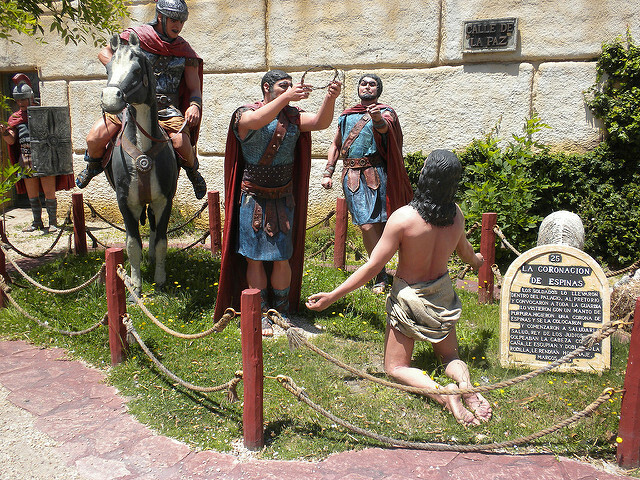 This country is so Protestant, so Evangelical, that it is positively refreshing to visit a Biblical theme park that is oriented toward Catholicism. The Tierra Santa Theme Park in Buenos Aires does not get many American or European tourists. Its website is in Spanish only. The park is set along the south bank of the River Plate, just west of the Aeroparque Jorge Newberry. 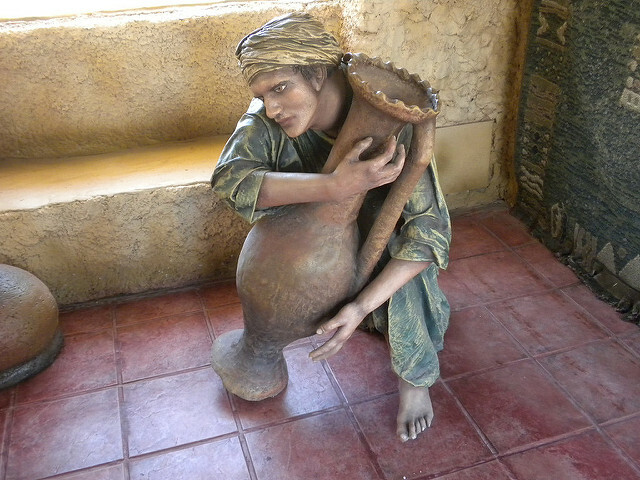 You can see animatronic figures of the Creation, of the Last Supper, and other events from the life of Christ. There are a few references to the Old Testament, but not many. If you get hungry, you can dine on pita bread with hummus and other foods that are reminiscent of the time and place. It’s probably better to go there via taxi, but both times I went, I took the Belgrano Train Line to the Estación Scalabrini Ortiz, only a few minutes from the Retiro railroad terminal. It involves taking a nice walk along the River Plate and looking across the muddy waters at Uruguay. There is generally a cool breeze along the river, which makes the 20-minute walk from the station bearable. Frankly, one of the things I like about South America is that it is unabashedly Catholic. 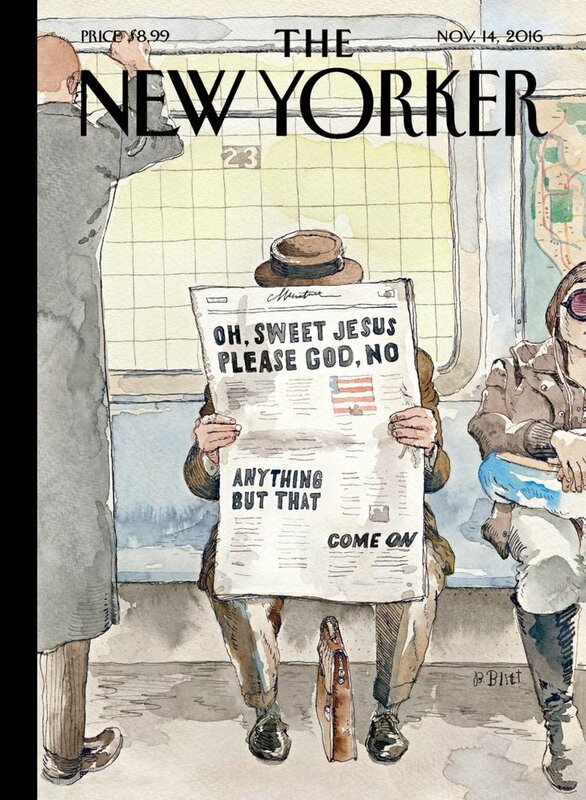 To be sure, the Evangelicals are making inroads; but I can more easily ignore them than I can in the United States. My pictures of Latin America include a lot of churches, because I visit a lot of churches. They look like churches. In Los Angeles, the Cathedral of Our Lady of the Angels looks more like a warehouse than a church. It was built by former Cardinal Roger Mahony: Therefore, it is often referred to as the Taj Mahony. I am currently reading Jan Morris’s Contact! (2009), which is a whole book full of serendipity type encounters which travel writer Jan Morris (formerly James Morris when she was a male) had all around the world. This is only the first of what will probably prove to be more postings along this line. 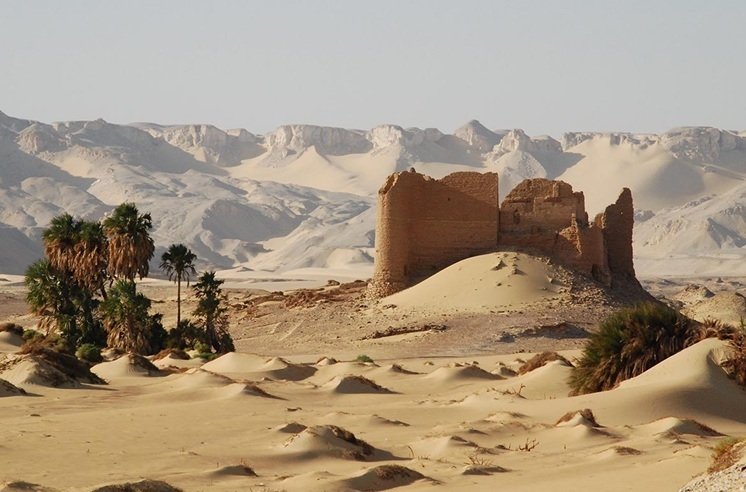 El Kharga is one of the five isolated oases which lie well to the west of the Nile in the Egyptian desert, and it always has been a place of exile. Nestorius was banished there, and Athanasius too, it is said. In our time political prisoners are immured in a detention camp at the oasis, and I once encountered some of them. They were patients in the local hospital, lying on straw palliasses on the floor of a bare ward. A murderous lot they looked, all the more sinister because bandages and plasters covered their eyes and supported their limbs—one and all were enemies of the state, and their interrogations had not been easy. I talked to them warily of this and that, the conditions of their detention and their hopes of release, and they told me that every morning they were given a lecture of indoctrination by a representative of the regime. Something in their eyes, though, told me they were far from brainwashed, and now and then a particularly savage old dissident lying in a corner intervened with a caustic witticism, delivered in the most cultured of English accents and with the bite of an incisive mind. Thus Nestorius might have spoken, I thought, during his exile at El Kharga. One of the biggest tourist draws in Buenos Aires is Recoleta Cemetery, surrounded on all sides by a high-toned urban neighborhood. Tourists go mainly to see where Evita Perón is buried (she’s buried there under her maiden name, Eva Duarte, in the Duarte family crypt. In addition to Evita, virtually everyone who was anyone was at Recoleta, including a number of former presidents, as well as numerous generals and admirals. Not buried at Recoleta is Juan Perón, who was refused admission there, buried at Chacarita Cemetery off to the south, and then, after the body was vandalized, moved to a special crypt at the Museo Histórico Quinta 17 de Octubre in the suburb of San Vicente. Not quite so well known is that Recoleta Cemetery is full of cats. It is one of several public places in B.A. that is infested with felines, including a botanical garden in nearby Palermo. The kind-hearted Argentinians typically feed these cats, so they are not quite 100% feral. They are a bit wild, however, though they recognize their benefactors. 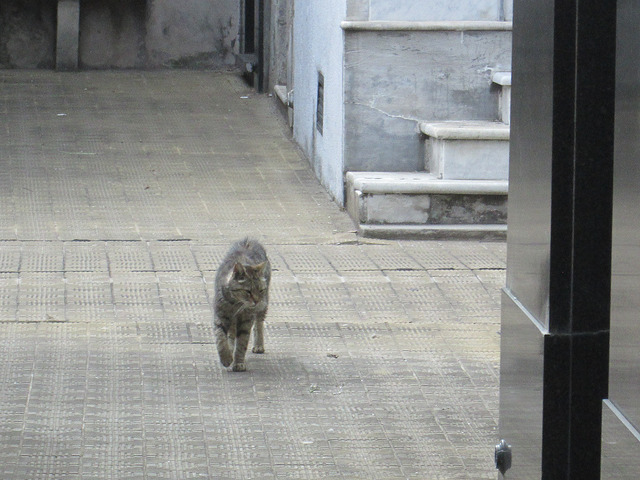 I thought the cats wandering the concrete walkways of the Recoleta were a nice touch. 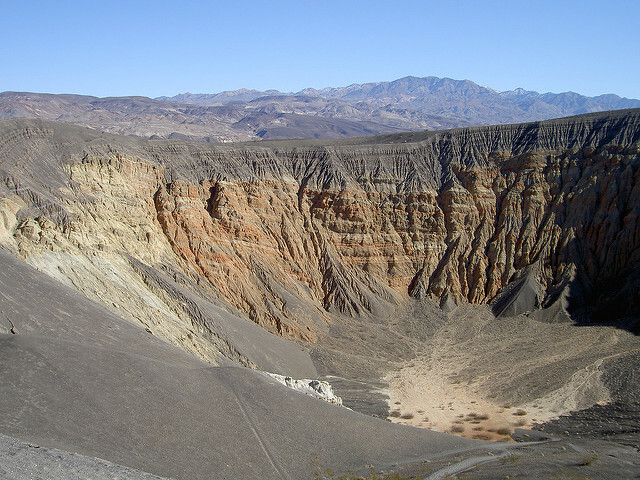 In January 2008, Martine and I spent a few days in Death Valley. 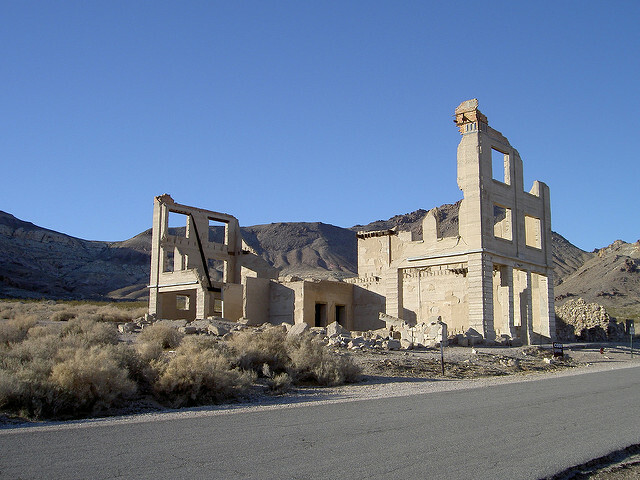 It is a totally fascinating place, surrounded by ghost towns (such as Rhyolite, above) and mining shafts. The fascination wears off somewhat if you should try to visit in the summer, as the rangers tell us that German tourists tend to do. When the thermometer hits 130° Fahrenheit (54° Celsius), tourism is secondary to survival. Crawling up the mountain pass of the Panamint Range, your car will pass several water tanks to replenish the fluid in your radiator. Should you not pay attention to your radiator temperature, you had best just pull over and crawl under your car with several gallons of water, preferably cool—at least to start with. Death Valley was the site of my first ever camping trip, back in 1979. We made it to Furnace Creek campground after midnight. Too weary to pitch our tents, we just lay our sleeping bags over groundcloths and dropped off, only to be awakened by early by a overactive flock of birds that landed in the campground or circled above our heads. The desert was starkly beautiful, and I fell in love with it from the start. I got an altogether different picture of the desert around 1995. Martine was working at the Twentynine Palms Marine Combat Center as a civilian employee. I would visit her several times during the summer, when it was REALLY, REALLY hot. I had to use an oven mitt to open my car door, lest my hand merge with the handle. I don’t know how Martine stuck it out there as long as she did. Eventually, she quit and moved in with me. Now my brother lives in the desert, in Palm Desert, to be exact. Of course, he has air conditioning and a swimming pool to take some of the sting out of the climate. But I will likely not visit him until the temperature cools. 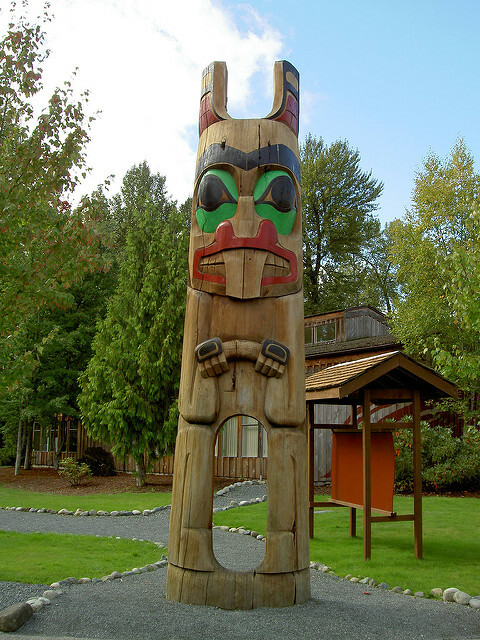 Totem Pole at Cowichan Center, Duncan B.C. 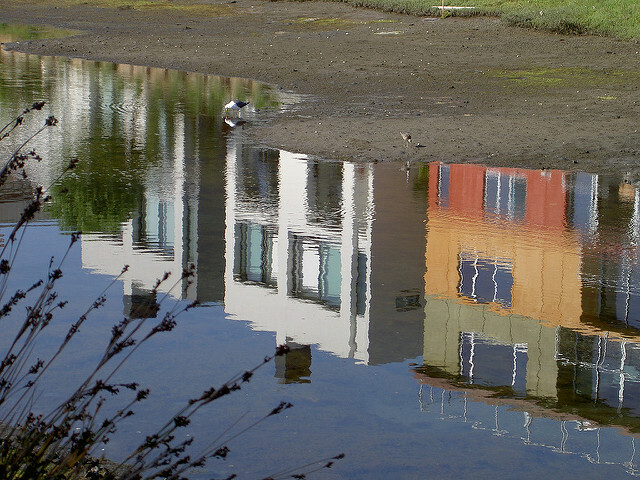 The first vacation I took with a digital camera was to Seattle, Victoria and Tofino (both on Vancouver Island), and the city of Vancouver. One of the highlights of that trip was a visit to Duncan on Victoria Island, roughly midway between Victoria and Nanaimo. The city bills itself as “The City of Totems,” mostly because of the large number of totem poles created by the Cowichan First Nation. 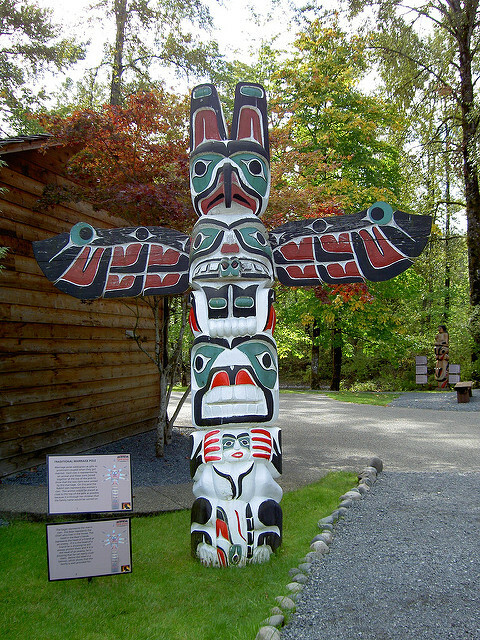 At he time (2004), there was a very active visitor center with a restaurant containing Cowichan delicacies and even a program of native dancing. On that particular vacation, I was traveling alone. Five years later, I repeated my itinerary from 2004. One of the biggest disappointments was the Cowichan visitor center in Duncan. Over a period of five years, neglect had set in. Many of the buildings, including the restaurant, were closed. It seems as if the center were re-positioning itself as a conference site for hire. I guess the economics of using the center as a tourist destination in 2009 were a bit prohibitive. I can only hope they make a comeback: On my first visit, I really liked the place. The German-American anthropologist Franz Boas was an expert on the early art of the tribes of the Northwest. His book Primitive Art (1927) attempts to explain how the totem poles functioned in the cultures of the various tribes. It’s a difficult read, but like many difficult reads, eminent worthwhile. Today, as I was driving to a history discussion group, I saw huge crowds of tourists lurking around Beverly Hills and perched on countless tourist buses. It is interesting to see that so many young people from elsewhere are interested in Los Angeles. Even if what they are interested in is mostly garbage: The shops on Rodeo Drive and the Hollywood Walk of Fame. But there is something about this place. Believe it or not, it’s the light. But you have to be receptive to visual nuances, something not quite as crass as a Gucci Bag or a star honoring the career of Rod La Rocque. And you have to be up early in the morning, or be around at dusk. Noon is just plain achingly bright. The funny thing is that you don’t see much of what L.A. is about by visiting Universal City or Disneyland or even the La Brea Tar Pits. You can get something of a feel for it when you see the Getty Center or the Arboretum or Descanso Gardens or the Huntington Gardens and Art Museum. But you have to be still and let the light play over you. The more frenzied your touring is, the less you’ll get out of it. Hell, it took me years before I could even see this place as it should be seen.